It’s hard to imagine in today’s age of multifaceted economies, a town developing and existing solely because of one industry. Yet, that is the story of Quebec’s Val-Jalbert. As an authentic company town of the 1920s, Val-Jalbert is a fine example of how community is built around industry, bringing together families, religion, and education to a place where none existed before. In Val-Jalbert’s case, it was a pulp mill that was the foundation, and ultimately, the demise of a community. The remains of this ghost town have since been partially restored and developed for tourism so that visitors can learn about Quebec’s industrial heritage. It’s an inviting place where you can step back in time and immerse yourself in history, all while enjoying exceptional accommodations, sophisticated food, and the beauty of nature. Here’s a look at my visit and tour of Val-Jalbert, along with a brief history of the village. Val-Jabert was founded in 1901 when Damase Jalbert built a pulp mill at the base of the Ouiatchouan Falls. The company-planned town was an ideal place for Jalbert’s workers to reside thanks to its close proximity to the mill. The mill changed hands a few times after the death of Jalbert in 1904, but the new companies continued to develop the community. The success of the mill enabled residents to enjoy many modern conveniences like electricity, sewer, plumbing, and telephone service, making Val-Jalbert the envy of surrounding communities. In 1927, the mill was abruptly shut down because of decreased demand for pulp, and by 1929 Val-Jalbert was a boarded up ghost town. The company that owned the plant failed to pay taxes and went bankrupt, so the Quebec government gained title on the land and former village. In 1960, the site was opened up to tourists and visitors can now enjoy 40 original buildings in one of the best-preserved ghost towns in Canada. I arrived at Val-Jalbert late in the afternoon, so decided to relax in my accommodations before having dinner at the restaurant in the old mill. My room was on the second floor of a renovated period home in the village centre. It was beautifully designed to incorporate a 1920’s feel with contemporary comfort. I had to try out the bathtub, which looked similar to clawfoot tub but had massaging jets. The best part about spending the night at Val-Jalbert was having the park almost all to myself after it closed for the day. I took a quiet walk along the river to Ouiatchouan Falls, then enjoyed a gourmet dinner at the mill restaurant. After dark, the falls were illuminated in colourful light- an unexpected touch that got me excited to explore the village the next day. In the morning, I hopped on a trolleybus for a tour of the park. We drove through the residential area where we got to see a row of wooden houses still intact, then others that were crumbling and falling in on themselves. It was interesting to get a sense of how time can stand still, yet change everything. Inside House 18, I watched a touching video of interviews with former residents of Val-Jalbert. It was very clear from the stories they told and emotions they showed that they loved growing up in Val-Jabert. Even now, I could feel this was a pleasant place to live way back when. After touring the house, I went into the grinders’ room of the old mill to watch the immersive show. It presented 110 years of history in an engaging way, with all-surround video and sensory experiences, like snow falling from the ceiling. It was a fantastic multimedia show and gave me a good understanding of what it was like to work in the mill and live in Val-Jalbert. After the immersive show, I took the cable car up the hill to enjoy panoramic views of Lac Saint-Jean and get a closer look at Ouiatchouan Falls. From the glass platform you can really witness the force of flowing water. It’s no wonder that hydroelectricity can be used to power Val-Jalbert in a sustainable way. Nearing the end of my trip to Val-Jalbert, I took a look around another house and the general store. Inside the restored store you can find regional products, souvenirs, and snacks to enjoy out on the veranda. The last building in Val-Jalbert I visited was the convent-school. The school is one of the best preserved buildings in the village and is the only school remaining in Quebec that was built with four classrooms, one for each of the primary grades. Inside the convent-school you can see the classrooms (which are pretty big, even by today’s standards) and the living quarters of the nuns. Actors playing the role of stern nuns help bring liveliness to the school. Staying overnight at Val-Jalbert was the highlight of my trip to the Saguenay-Lac-Saint-Jean region of Quebec. The stories of this one-industry village and the people that lived here, brought life and intrigue to a site that on first glance, looks not much more than a small collection of old buildings. Yet, through the narrative of the costumed characters, video interviews with past residents, and captivating multimedia show, Val-Jalbert feels so much more than a living history museum. 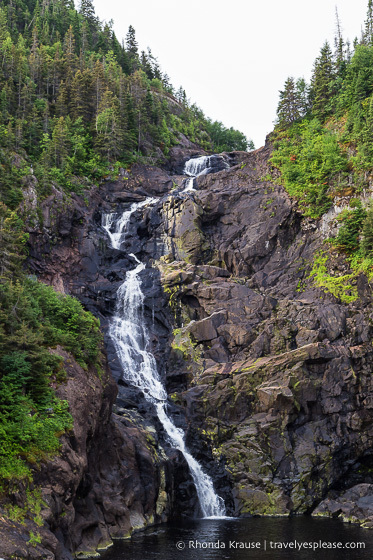 It’s well worth exploring if you’re visiting the Lac Saint-Jean area. Location: Val-Jalbert is located near Lac Saint-Jean and the town of Chambord in Quebec, Canada. Operating Season: Val-Jalbert is open from May to October. Length of Visit: If you don’t spend the night, you can experience the village in about 3 hours. Accommodations: There are 24 rooms in period homes (including above the general store) in the heart of the village. The accommodation package includes a tour of the site, table d’hôte dinner, and full breakfast. There’s also a campground with 190 sites, 15 mini cottages, and heated outdoor pool. A stay at the campground includes a discount on admission to the historic village. For your convenience, here is a link where you can book a stay in the historic village of Val-Jalbert. It costs nothing extra and helps support this website. Thank you! The house I stayed overnight in. I was hosted by Quebec Original and Tourism Saguenay-Lac-Saint-Jean in order to bring you this story. As always, I only speak the truth and hosts have no editorial influence on articles.